From bright green, pale green to emerald and khaki. The Green color is the symbol of life, growth and rebirth. Venus color, that represent to the Roman, the goddess of garden. Green, this fresh color is used by our designers to bring harmony and depth to their collection. Let’s present you how they use the peaceful color into their AW18 Collection. “The Man Who Measures the Clouds” (L’homme qui mesure les nuages) is an art piece by Jan Fabre that Vibskov came across last summer during his travels in Kanasawa, Japan. The poetic gesture of measuring something unmeasurable inspired him and the team for the A/W18-collection. Henrik Vibskov used khaki for its reversible Eco Drop Coat. 44Studio has been founded by Xavi Garcia and Franx de Cristal 3 years ago in Madrid. 44Studio arises from the idea of creating a fashion without barriers, free of labels or genres that define or limit itself, where there is a place where women are seen with oversize jackets or masculine looks and where men are free to wear skirts or dresses. 44 Studio, the forest green color is mixed with Navy for a tartan print on a slim tailor. Following his trip in Florence The cradle of the Renaissance gives full inspiration to Willlhelm for this AW18 collection. The designer explores the Italian master pieces by Leonardo Da Vinci, the “Savior” and the “Gioconda”, icons illustrated as prints and weaved into his garments. The collaboration with MYKITA sunglasses brings a stylish 90’s touch into such iconic collection. Here Bernhard Willhelm use khaki for an otherside jacket in SLY fabric. 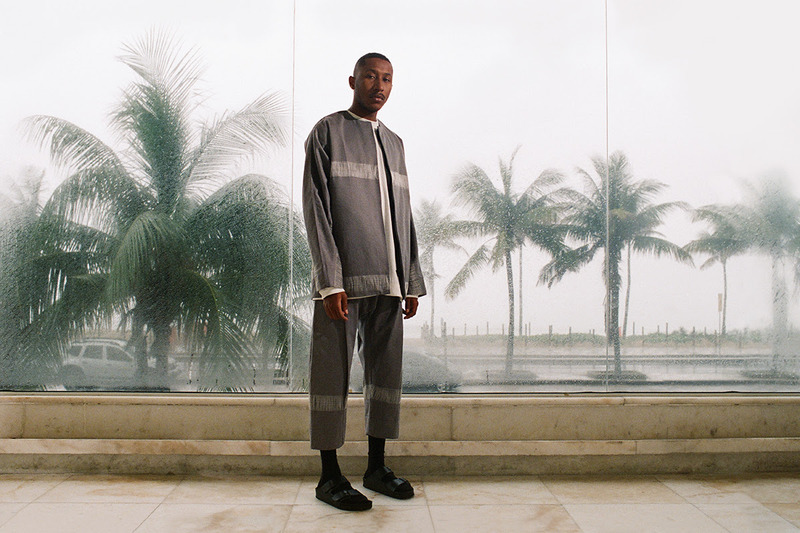 AW18 collection is a tribute to the Cuban artist Ana Mandieta. Her artwork « Earth-Body » is often associated with four basic elements of nature. This spiritual and physical connection is the story that reflect SOIL REBELLE collection. The story of the human body and earth. sophisticated and feminine for Wanbing Huang AW18 Collection with a silk and satin dress. As a precursor, the Canadian based in New York, Arielle de Pinto introduced the crochet chain technic to the worlds of contemporary art and fashion. Uniquely fusing crocheted metal and semi-precious stones, Arielle de Pinto’s hand sculpted jewellery has garnered admirers for its understated yet directional appeal. Combining vintage elegance with modern sensibility and intuitive, self-taught jewellery techniques, de Pinto’s signature aesthetic and unmistakable visual identity was quickly recognized and has garnered her a dedicated international following. The collection as been shoot in a greenhouse, where the jewellery are in harmony with nature and spirituality. Design Studio was established in Seoul in 2010. In order to achieve a progressive aesthetic, FLAT APARTMENT creates products that re- flect everyday subtleties, art and culture. Made using high quality materials and with a minimal design, their products com- bine a unique mood with artistic touches and are crafted by Seoul’s leading artisans. For Flat Apartment, the green is more bright for a fun and modern look with the Mary Jane Ballet flat and the extreme sharp toe pump with front flashy ties. For Beira, green is not only a color but a way of thinking. The city of Rio de Janeiro represents Beira’s homeland, where challenges and opportunities shape the pillars of product development. In this sense, the challenges prompt and permeate the complex Brazilian trajectory. The term “genderless” is used to simplify the understanding that garments are made both for men and women. Therefore, Beira can be considered feminine and masculine. Fabrics play an important role in Beira, since we use high quality natural fibers in all collections. Most of them are 100% silk or 100% cotton, sourced mainly from Brazilian suppliers.